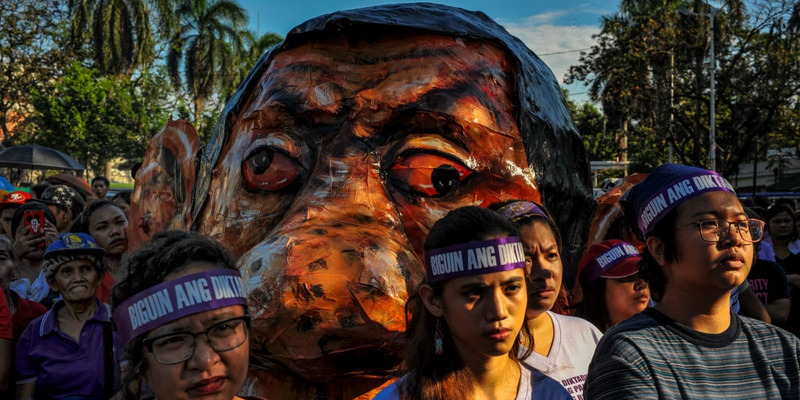 Jes Aznar/Getty ImagesWomen rally against President Rodrigo Duterte for International Women’s Day on March 8, 2018 in Manila, Philippines. The Duterte administration created a 600-person terror watchlist and declared a top UN human rights investigator as an affiliate of terrorists. The Duterte administration has created a 600-person terror watchlist that includes a top UN human rights investigator. The Philippines’ Department of Justice filed the list in a Manila court last month seeking approval for calling the individuals terrorists, according to Reuters. Once declared a terrorist, the government can surveil and monitor funds more closely. The list included UN Special Rapporteur Victoria Tauli-Corpuz, a Philippine investigator who specialises in the rights of indigenous peoples, alongside leaders from the Communist Party of the Philippines (CPP) and its armed wing, the New People’s Army (NPA). “The [Philippine] government sees this as an opportunity to pursue people they don’t like. I am worried for my safety and the safety of others on the list, including several rights activists,” she told Reuters. Human Rights Watch researcher Carlos Conde called the 55-page filing a “virtual government hit list” and said the list puts over 600 people “at grave risk” of government retaliation. “There’s a long history in the Philippines of the state security forces and pro-government militias assassinating people labelled as NPA members or supporters,” he said. “These attacks cannot go unanswered, the UN human rights council must take a position,” he said. The notoriously outspoken Duterte has called the UN “stupid” over their condemnation of his extrajudicial war on drugs, which, by some estimates, has killed more than 12,000 people. Duterte has also publicly criticised the UN Commission on Human Rights and the UN special rapporteur on extrajudicial killings Agnes Callamard, who he said he would “slap” if she began her investigation. In November, Duterte terminated peace talks with communist rebels and expressed a desire to consider them “terrorists.” The nearly 50-year long conflict with communist groups has led to the deaths of more than 40,000 people.